Opportunity to buy a renovated detached house in a village centre within a short level walk to bar/restaurant/shop. AHIN-SIF-00I002 Nr Domfront 61700 Imposing fully renovated Farmhouse with stone barns and 1.25 acres of garden in quiet rural position. Detached three bedroom village house with large garage and courtyard garden for sale near a Golf Course in Normandy. AHIN-SIF-00988 Mortain 50140 Spacious modern house with superb views across to Mont St Michel for sale in Normandy with garden and garage and within walking distance of all amenities. AHIN-SIF-00985 Nr Barenton 50720 Spacious 3 bedroomed house in need of modernisation. The land is level and to the side and rear of the property. The ground floor of the house was re-wired approximately 1 year ago and the hot water cylinder was replaced 2 years ago. There is a recently fitted shower room on the ground floor. AHIN-SIF-00955 Montsecret-Clairefougère 61810 Detached 3 bedroomed stone house in rural hamlet with superb views in an area popular with walkers. 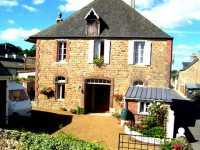 The house is built in the Maison de Maître style with accommodation over 3 floors and light and airy rooms. The property benefits from oil fired central heating, centralised mechanical ventilation and wood framed double glazed windows with shutters. AHIB-SIF-00918 Domfront Area 61700 House to finish renovating with attractive garden in small rural hamlet 2km from a pretty village with amenities. he property was renovated about 10 years ago, at which time it had a new roof and insulation, argon filled aluminium framed double glazed windows, new floor, etc. It has been used as an office so the interior needs dividing into rooms.